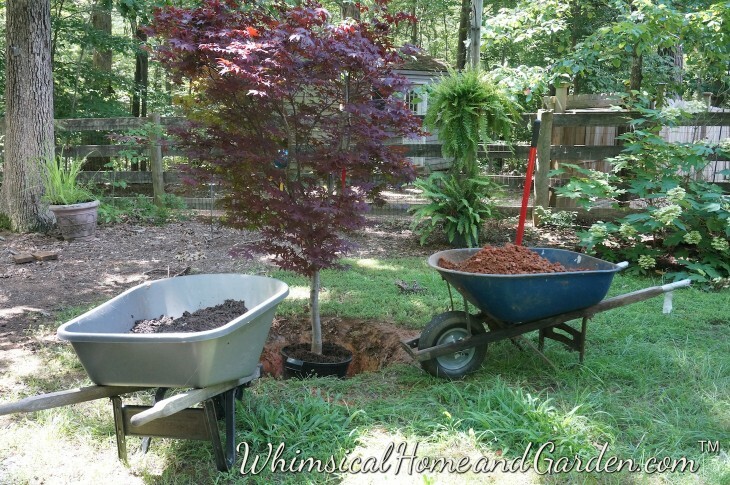 It all started when I said I really wanted to plant another Japanese Maple and thought it could go to the left of the garage to break up all the very tall, tall green trees and the green of the flowering shrubs. 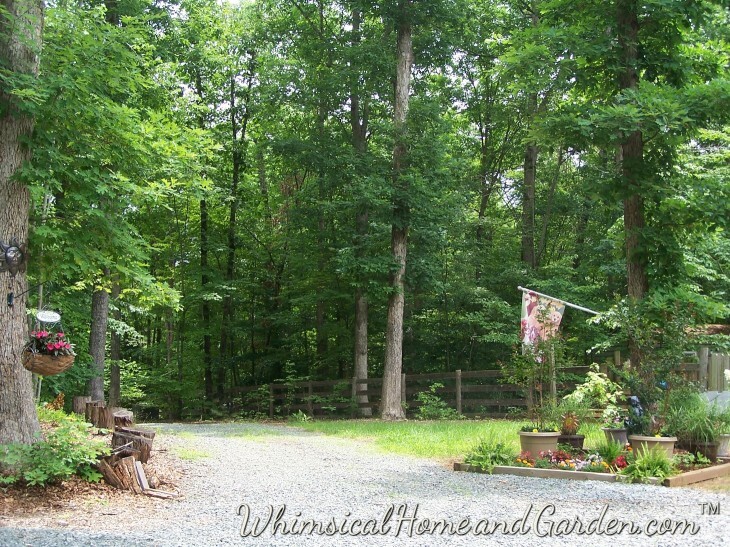 I shared with you the pocket garden we added to the side of the house (if you missed it, you can read about it here) and mentioned that we were working on two other areas as well. Below are some photos of the one we really expanded on the garage side of the house. It started with a small raised bed garden and we expanded it from there. In fact we expanded it to include another complimentary garden near it. Isn’t that how it always happens? 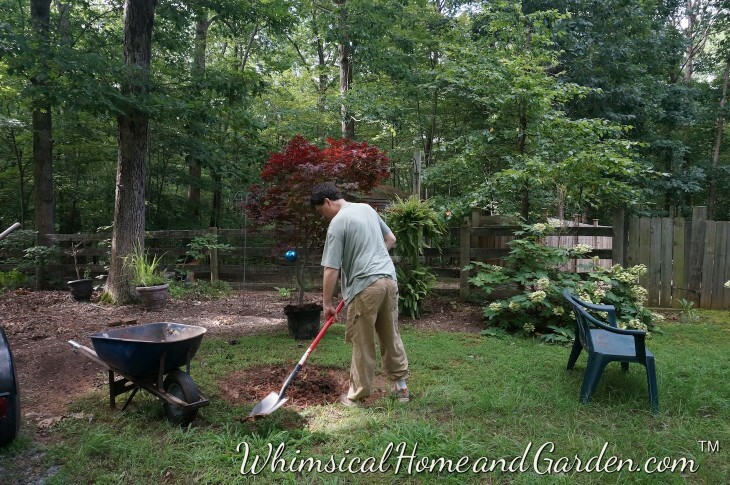 A new tree leads to not one, but several new garden areas. 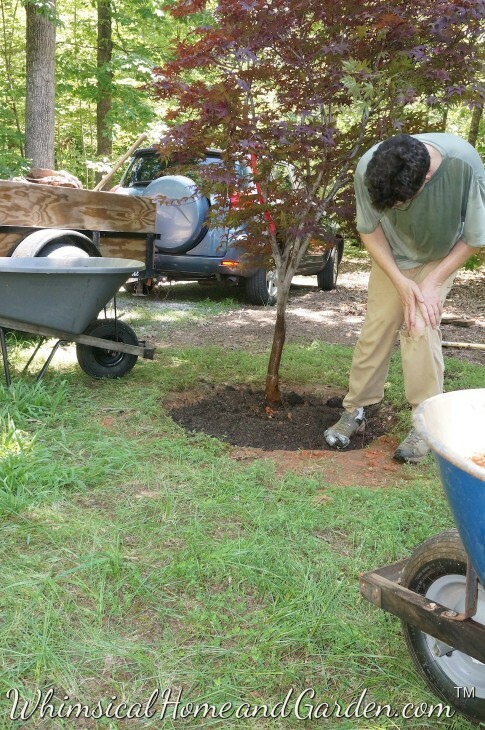 Can’t have a new appliance without remodeling, or so I have heard……..Today….the planting of my gift from kbj of a Japanese Maple tree. I had gotten him one as a house warming gift for his home. That tree now sits in an oversized container in a back garden. This one is going in the ground. 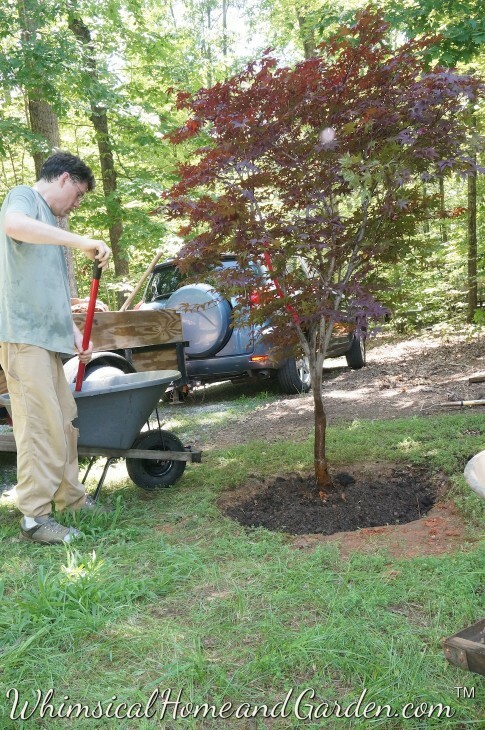 On to some photos and some suggestion as to how to plant a tree, especially one that is root bound, as this one was. When you enter the first entrance of our U shaped driveway, you see the west side of the house then when it curves you see towards the other entrance, and this view. In front of the the big oak in the center is where the new Maple will be planted. 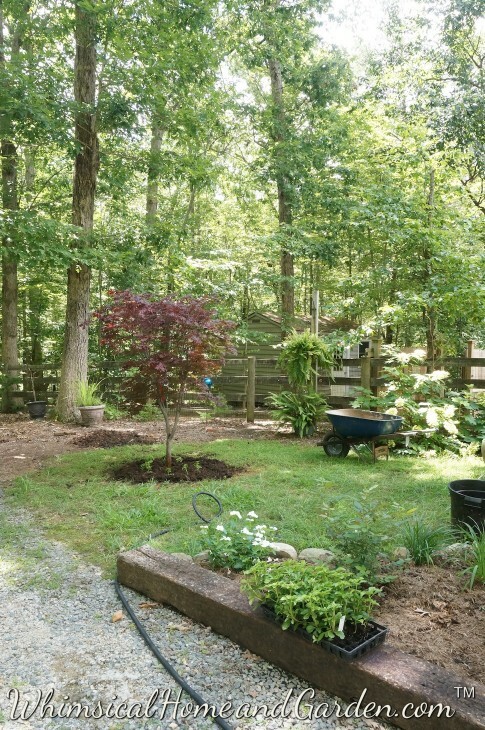 Around that oak became a new garden area as a result. The raised box in front to the right is where we greatly expanded that area. All this is to the left of the garage entrance. Notice all the tree stumps lining the drive to the left? Right after we moved in one of the huge and very healthy Oak trees came down in a wind storm straight into the garage. The garage door was open and all the limbs and branches were inside the garage and all the trunk outside across the drive and parking area. It did a bit of minor damage to the gutter and that was it!!! The garden house, which is directly across from the garage, was not yet built, otherwise it would have been totaled, as the Oak was directly behind where the garden house now sits. Talk about luck. 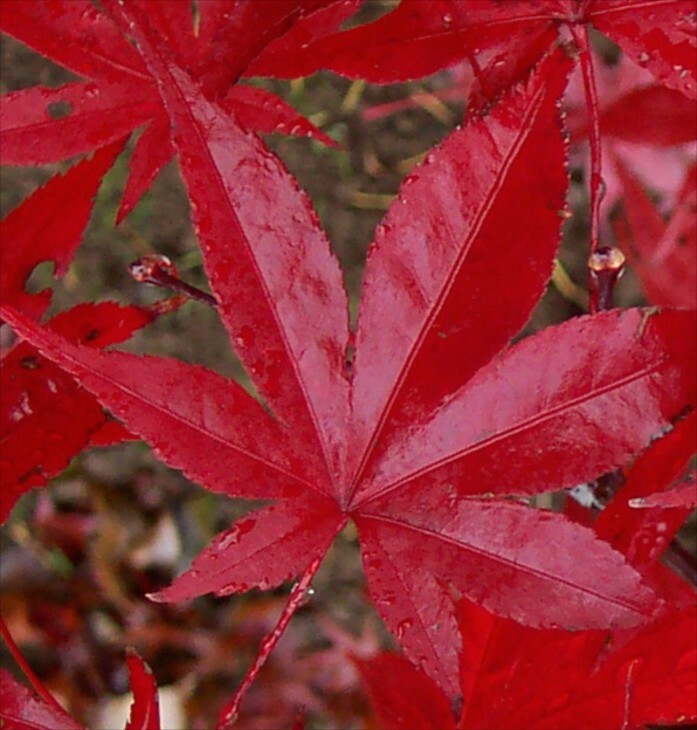 The maple selected is Japanese Maple Emperor or Acer palmatum Emperor 1, an upright growing tree. Another maple variety Bloodgood . Some feel that the Emperor is a tad more hardy than the BG and may hold its color better. The Emperor is fast growing, hardy and easy to grow. It will reach a height of 20 to 25 feet (which is perfect as an understory tree in my woods), and makes an excellent street or small yard tree. 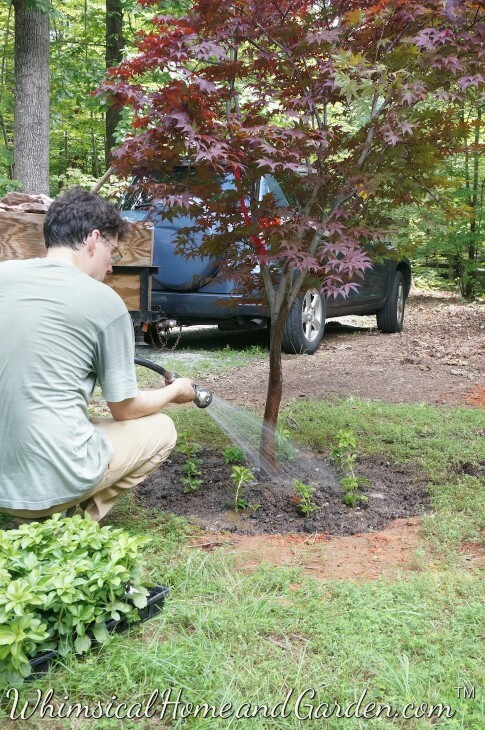 It leaves out about two weeks later than most Japanese Maples giving it the advantage of less spring frost damage, which helps if you live in a northern climate. The leaves in spring are a dark reddish purple (and even in August mine is still colorful) and in fall a brilliant crimson red. In the south it appreciates afternoon shade and full sun if you plant it in the north. 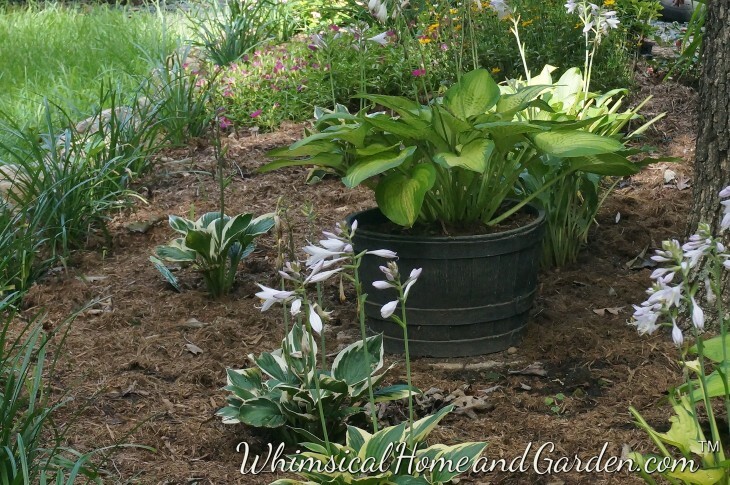 It is suggested to feed it once a year with a slow release fertilizer, although I fertilize with compost when I plant and then it is on it’s own. Once established the tree does fine, but the first year water moderately, or until established. Here is a closeup of it beautiful leaf. Source. 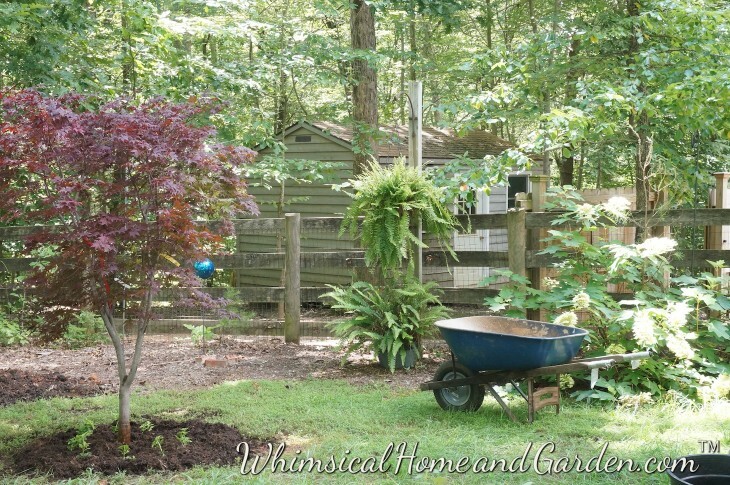 You can see my beautiful Japanese maple behind kbj, waiting to be planted. Fortunately it was not raining. We placed it where it would be visible and draw the eye to the new garden that ended up behind the oak and the new maple tree. Even with the copious amounts of rain this summer, and although kbj did not need a pic axe, you can see the not so terrific clay soil. You can see he ran into a few tree roots, but it wasn’t as bad as it might have been. Of course that is easy for me to say as I sat on the bench taking photos and was not the one digging! 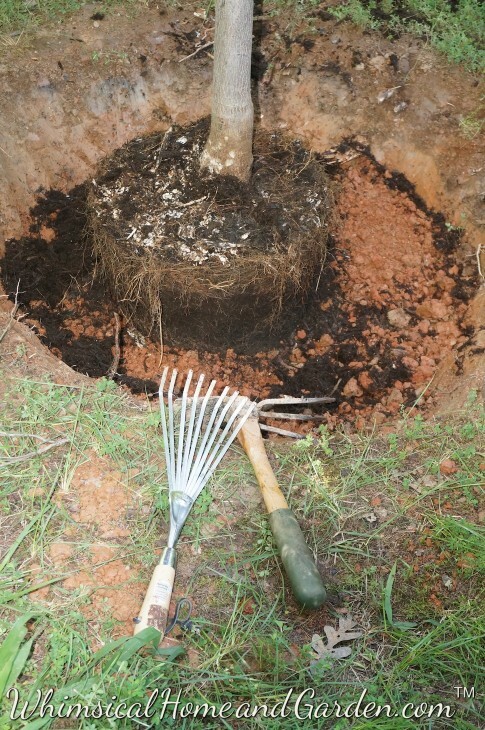 It is best to dig the hole twice the size of the root ball at planting and a bit deeper so that you can add good soil at the bottom of the root ball at planting. 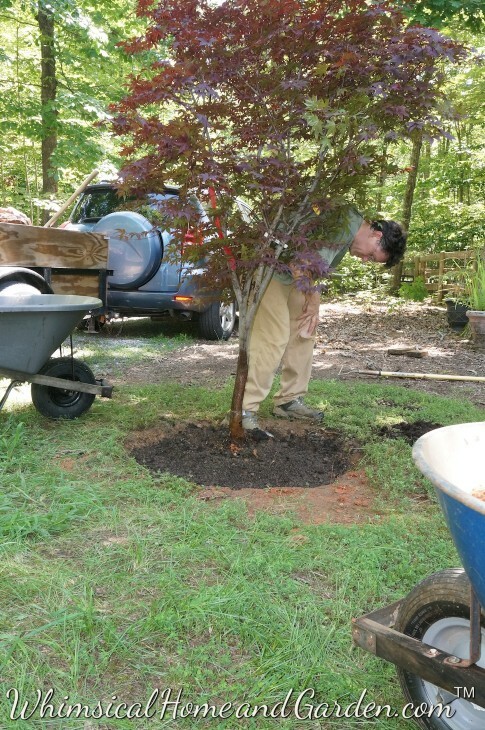 Try not to pick up your tree by the trunk if at all possible, but do test lower it into the hole to check that your hole is large enough. 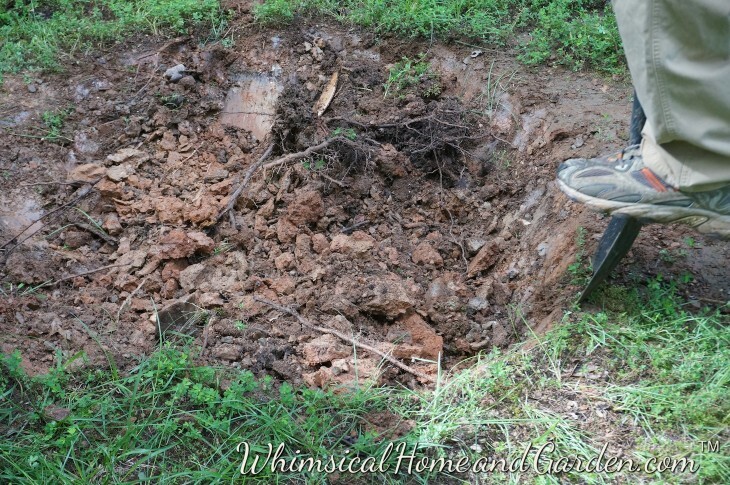 In this photo you can see that the hole is deep enough that we can add good garden soil when planting. We had already brought in soil for another area and we used mostly that good soil along with some from the original hole. 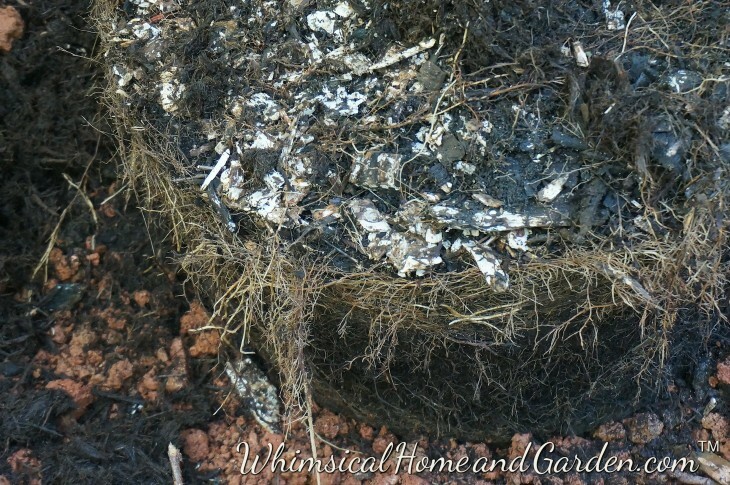 When we removed the mulch that was on the top of the root ball in the container we noticed all the roots at the top of the tree’s root ball. That is not good. Here is a close up. The major root development should happen below. The reason this happened was because at the nursery they had the trees in the plastic container, then buried the container in massive amounts of mulch to protect it. 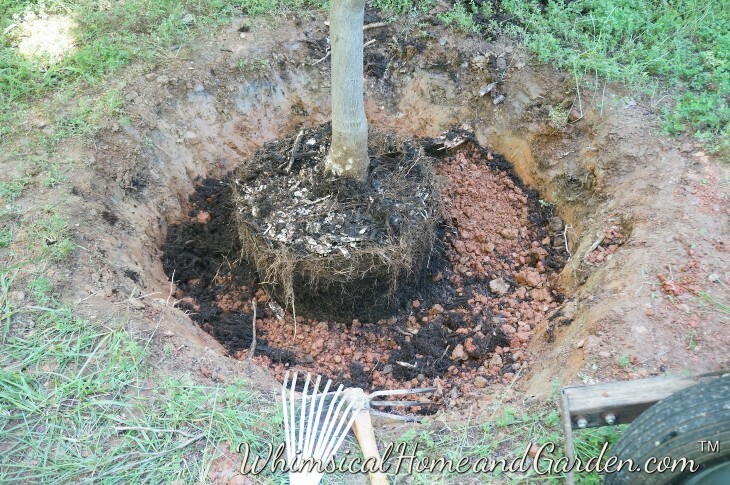 But what happens if left too long like this is that the moisture in the mulch allows the tree to easily get its moisture from the top, so the roots develop at the top and in a circle because of confinement in the round container instead of seeking water lower in the ground. 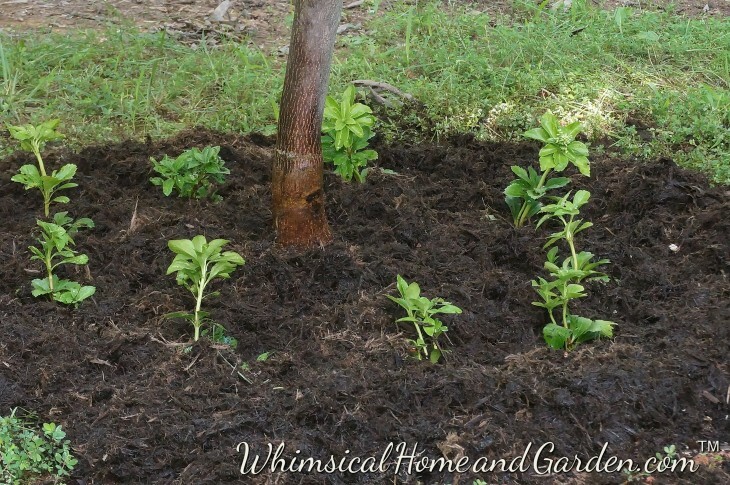 These roots also grow in a circle and if you don’t loosen and rough them up considerably before planting, they continue to grow in a circle and the tree will strangle itself or just not do well at all. Be brave and pull them apart gently. The solution? Two of my favorite tools. I used them to pull apart the roots growing in a circle at the top so they can grow out and away from the tree. I then used the rake to loosen the roots along the sides, although there were not too many strong roots there at all. You can see now that the root ball at the top no longer is encircled by roots. 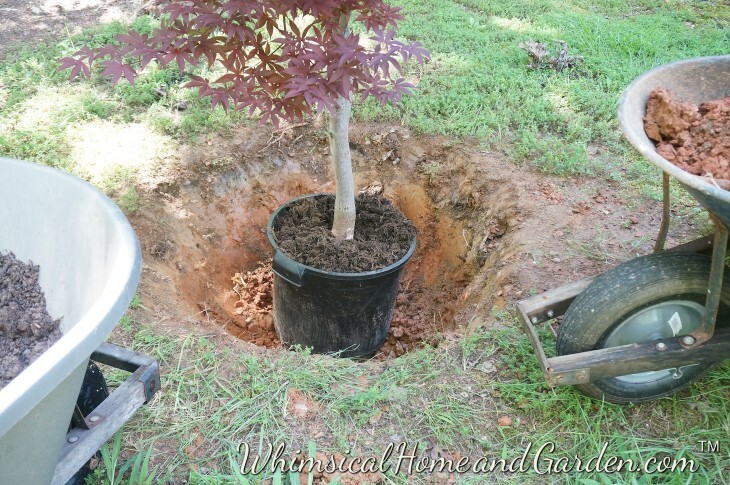 Before we placed the tree permanently in the hole, we also flooded the hole with water, placed the tree, and then began to backfill. 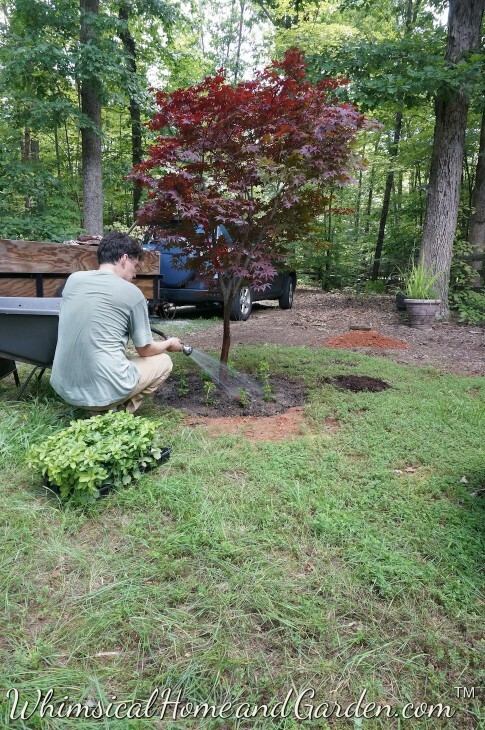 kbj compacts the soil after adding to eliminate air and ensure firm connection of root to soil. oops, I got distracted and took photos of a pot of hosts under a nearby tree. KBJ continues to backfill, adding water as he goes along. Looking good. Although it was early morning, it was very humid and he is sweating up a storm. Round and round he goes, making sure the soil is compacted. 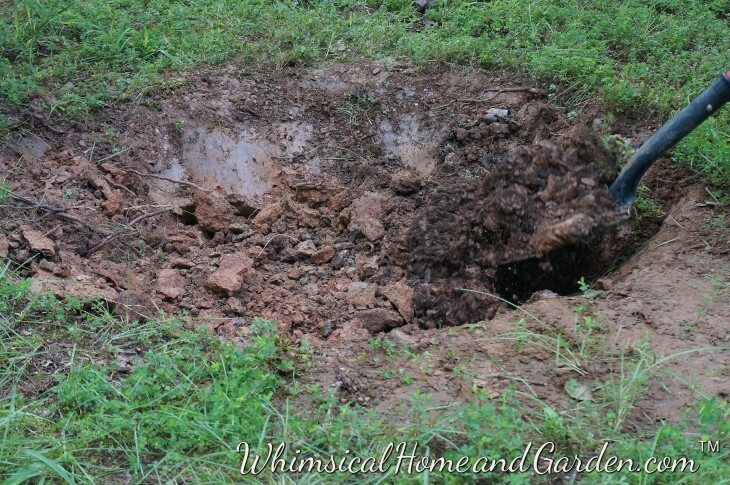 Before we placed it permanently in its hole, we had taken time to spin it around to make sure that we liked its position and how it looked as you approached it. We all have our “best” side, and so do plants. Giving it a good final soaking for the day. 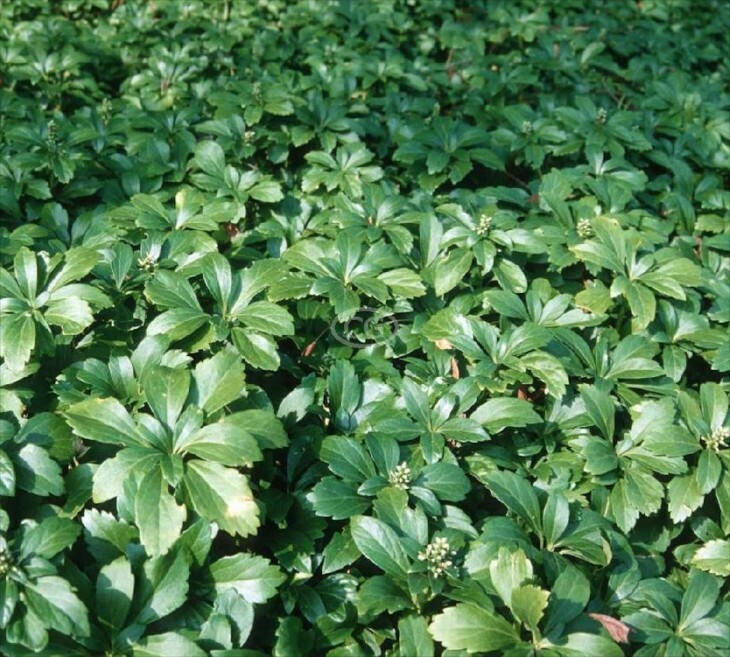 You might have noticed that there is a flat of Pachysandra (Japanese Spurge). I took some and planted them around the tree. 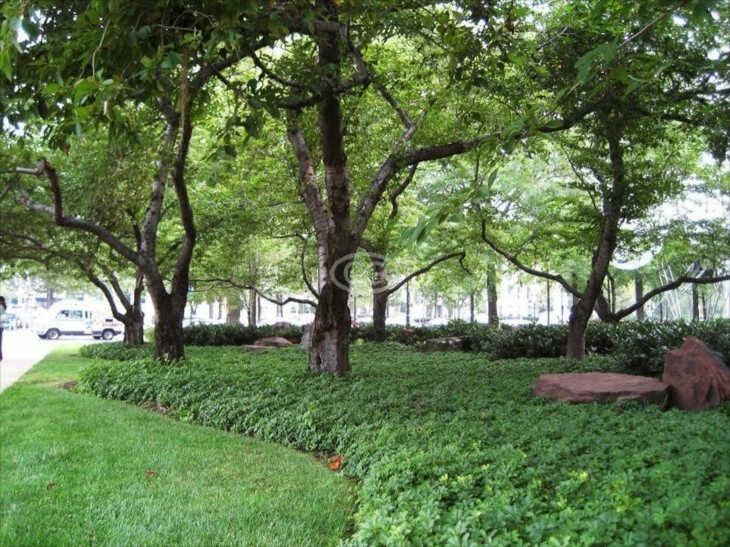 It is a wonderful evergreen perennial ground cover that is related to the boxwood. It spreads by runners and under trees it gives a wonderful texture and finished look. 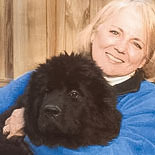 They grow only about 8-12 inches high, and does well in shade and semi-shade. If grown in hot sun and climate, they will look more yellow-green. 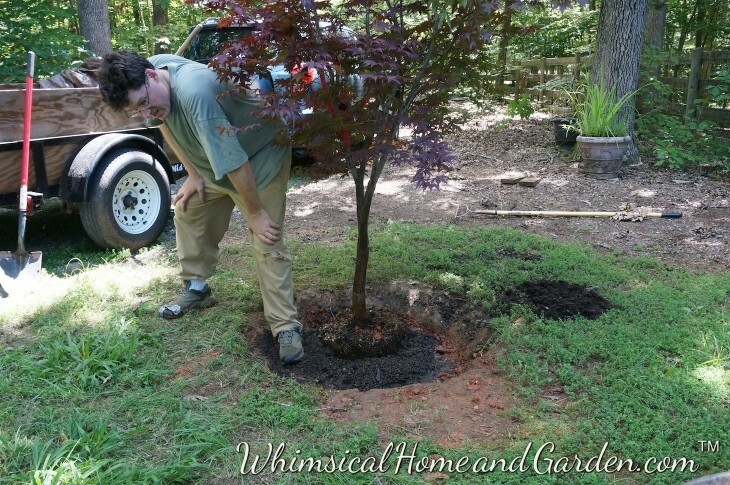 So here the tree is planted, underplanted and mulched. 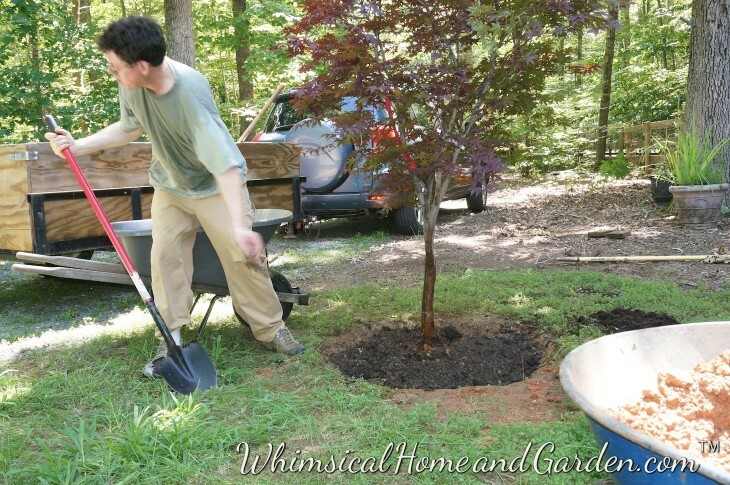 Keep the mulch away from the trunk of the tree by a few inches. Keep it watered and it will reward you with color, looks and shade. And this is the view we looked at first, then at each other, and almost at the same time said, Okeedookee…..looks great, but what should we do with the space behind it? Looks like another garden project! Yes, KBJ works very hard for my blog. He did all the web development and does all my blog technical management on top of helping me on so many of the projects. Glad you were able to find the post useful. One of the most beautiful Japanese maples I have ever seen is on that is in my cousin’s back yard. It is growing between massive boulders that are beside their swimming pool, and it weeps over one of the boulders. I would so love to have the boulders and this beautiful tree. It is a much smaller variety, but with all the years it has grown there, it is quite impressive. They are such beautiful trees.